This is a beautiful print taken from an original pencil drawing by artist John Sutton. This is printed on quality canvas which has been stretched over a 20mm thick pine frame. This comes with a good quality Quartz Clock Movement (Battery Included). The image is mirrored on the sides of the canvas frame to create a wraparound effect. Signed by Artist John Sutton. The size of the canvas clock is 273 x 420 mm or 11 ½ x 16 ½ inch (A3 approx). This print is an enlargement from the original A4 artwork, so the pencil and paint marks may be more prominent. WE SHIP FROM THE UK. The canvas clock will be wrapped in bubble-wrap and will be shipped in a strong cardboard box. WE HAVE MANY MORE CANVAS CLOCKS AVAILABLE - THIS IS ALSO AVAILABLE AS AN A3 or A4 ART PRINT - A3, A4 or A5 CANVAS PRINT - A3, A4 or A5 CANVAS CLOCK - A3 CALENDAR PRINT - ACEO SKECTH CARD - COASTER - FRIDGE MAGNET - KEYRING - MOUSE MAT. **WE ALSO HAVE A GIFT SET OF AN A4 CANVAS, A4 PRINT, COASTER, FRIDGE MAGNET, KEYRING, MOUSE MAT & SKETCH CARD AVILABLE FOR JUST £18.00. **EXAMPLES CAN BE SEEN IN THE LAST PICTURE. ** PLEASE VISIT OUR AMAZON STOREFRONT TO SEE ALL OUR PRODUCTS. 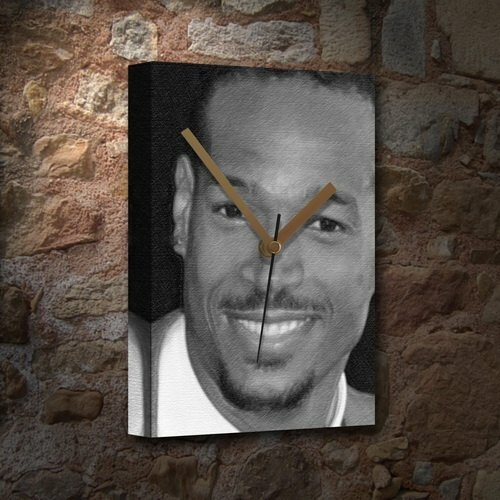 If you have any questions about this product by Canvas Clocks (LARGE A3) - Actors, contact us by completing and submitting the form below. If you are looking for a specif part number, please include it with your message.